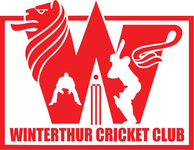 The Winterthur Cricket Club made their annual pilgrimage to the Lombardy region of Italy to play two days of cricket on Saturday 8th and Sunday 9th May 2015 against visit our friends at Idle Cricket Club in Lodi. View more photos of the WCC's Lodi Tour. This annual tour to Lodi is renowned for the cricket, camaraderie, food and wine.And good results from three of the four tour objectives must count as a successful tour. 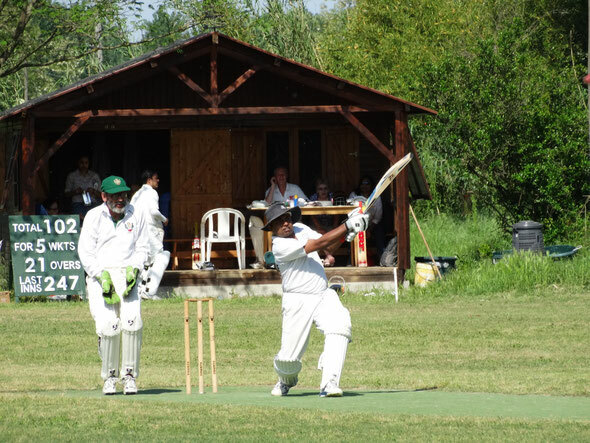 WCC played Idle CC in two games over the weekend (40 overs a side on Saturday and 30 overs a side on Sunday). In the first game, WCC won the toss and elected to bat first. Matt and Rehman opened the batting and started well with Rehman's aggressive intent fetching him a huge Six over long-on. But he was out soon afterwards. Six and out seemed to be the order of the day as Selva too followed suit in a similar manner. Selva looked poised to make a big score but was unlucky to slip and be stumped. After a mini collapse (Jiten for a duck, the Andys for not much between them), Sara and Vaibhav steadied the innings with Sara playing a steady knock to reach 22. After Sara and Tom were out cheaply, Hasta and Vaibhav staged a mini recovery. However, the innings ended soon with the quick wickets of Hasta and Vaibhav. Vaibhav(27), Sara(22) and Matt(22) were the pick of the batsmen as WCC mustered 176 all out off 37 overs. Hasta opened the bowling and was causing a lot of trouble to the opening batsmen with his swing and bounce. However, despite a probing spell, he could not provide the much required breakthrough. From the other end, Sara struggled for rhythm and was not effective in his first spell. The change bowlers, Rehman and Vaibhav exerted good control but the real bowling star was Jiten who picked up 2 wickets in a miserly spell. However, Idle CC batsmen (Keerthi and Shaun) were motoring along, albeit a bit dangerously. Keerthi was especially harsh on every bowler and helped himself to a half century along the way. Despite a late flutter, Idle CC still made it across the target with plenty of overs to spare. It was a good effort from WCC but just not good enough to beat a full strength Idle CC. There were a few bright spots like Sara's and Matt's batting and Hasta's bowling. Batsmen like Selva and Tom who always manage to look good in the middle hold a lot of promise and look set to strike it rich in this coming season. The off-field fun and nonsense started off with a karaoke evening at Rehman's bar in Lugano on the way to Lodi. Here, John enthralled everyone with his rendition of "I am a Gigalo" (dont know who would pay for his services though!) and forced everyone else (Alex, Tom, Hasta, Minda) to also have a go. The night in Lodi was also filled with a lot of spirits with John claiming that he usually finishes in 9.1 seconds. Finishes what is left to interpretation. John claims it is 100m sprint that he was talking about. The rest of us vehemently disagree. Keeping with the Lodi tradition, John needled Hasta into a bet that meant he will have to part with his beloved Mustang if Hasta did not bowl a first ball wide. But to avoid paying the price the next day, the corrupt president threatened the umpire into calling wide for a perfectly legal delivery. Dinner on Saturday was arranged by the Idle CC and the amazing spread of Italian delicacies and good wine kept the evening rolling. Marco and Joe of Idle CC kept us enthralled with stories. The party continued until much after dinner with Trevor (a friend of Andrew Webster who was in Lodi as a spectator) taking over the life-of-the-party role. Idle CC batted first on Sunday and WCC opened the bowling with Hasta and Sara. This time around, Sara was menacingly good while Hasta was incisive but struggled a bit with his line and length. However,off Sara's bowling, Hasta took a rare difficult catch in the outfield to send back potential dangerman Shantha. Sara finished an unchanged spell of 6 overs with 2 wickets. While Rehman and Vaibhav tried gamely, the batsmen went after every delivery with no mercy and accelerated to almost 10 runs an over scoring rate. Selva, Matt, Chris, Jiten were all thrashed all around. Vaibhav was economical initially but was clobbered later too. It did not help us that Vaibhav dropped an easy catch of Keerthi who ended up with a quickfire century. Shaun also chipped in with a 80+ score as Idle CC ended up with 250 runs off 30 overs. In reply, WCC opened with Matt and Selva who were out cheaply. While the asking rate was always high, it did not help that we lost the first three wickets cheaply. However, Sara and Vaibhav built a decent partnership until Vaibhav was out for 15. Tom found some batting form and smacked around 4 boundaries to reach a quickfire 18 but he threw away the start with a weak shot to be caught. Hasta joined Sara and the pair batted sensibly picking out bad balls to hit and defending strongly against good bowling. However, once Hasta was out, the innings ended soon at 170-odd with the only remaining highlight being John's boundary. The star of the batting was of course Sara (Saravedi henceforth). He played sensibly nudging the ball around for quick ones and twos but also hitting the powerful boundaries and huge sixes off the bad balls. Saravedi ended up with 53 not out and his all round performance bodes well for the future of this season for WCC. Of course, a special thanks to the WAGs and social members who made the tour. Ray, Anne, Minda, Trevor, Ushma, Jana, Emma, Veena and Pavi made the tour much more enjoyable. Another non-playing member who livened up the proceedings was our own inimitable Alex Mackay who umpired both the games in his usual fair (blind and wrong to both teams is fair as well!!) style. And a big note of thanks to our hosts Idle (Lodi) Cricket Club!